The global distribution of precipitation is influenced by the general circulation of the atmosphere, proximity to large bodies of water, and topography. Precipitation is most abundant where air rises, and least abundant where it sinks. It also tends to be greater near oceans and lakes, and in higher elevations. The Earth's atmosphere is known to have regions characterized by largescale rising air, and other regions with descending air; these vary by latitude and by season. Rising air is found primarily near the equator and in the midlatitudes (40° to 60° North and South latitude), so these tend to be wet areas. Descending air dominates in the subtropics (20° to 30° North and South latitude) and the poles. * The global distribution of precipitation shows that the wettest areas on Earth are in the "rising air" zones, while the driest areas (subtropical deserts and the even drier polar areas) are in the "descending air" belts. As the Earth revolves around the Sun during the year, the orientation of its axis relative to the Sun changes. This causes the apparent position of the Sun relative to the Earth to change, and creates distinct seasons. Between March and September, the axis of Earth is tilted toward the Sun, and hence the Sun shines more directly over the Northern Hemisphere, resulting in more sunlight, more heat, and the warmer temperatures of Northern summer. In the other 6 months, the Earth's axis is tilted away from the Sun, and the Sun shines more directly over the Southern Hemisphere, bringing summer to countries south of the Equator (and winter to the north). The "rising" and "sinking" zones move northward and southward with the Sun's path. Thus, the wet area near the Equator moves northward into the Northern Hemisphere in its summer, and southward into the Southern Hemisphere during its summer. Similarly, the dry zones and wet zone at higher latitudes shift northward and southward throughout the year. If the Earth had no mountains, and oceans were homogeneous with respect to their heat content, the climate would occur in latitude bands like those listed above. However, mountains indeed exist, and they exert a strong influence on precipitation, as do warm and cold ocean currents. When moving encounters a hill or mountain, it is forced to rise. Because rising air cools and condenses, precipitation is heaviest on the upwind side of a mountain, where the air is rising. This process is known as orographic lifting. On the downwind side, air descends, warms, and becomes drier. * In some parts of the world (such as the tropics), winds are steady throughout the year, and if these steady, moist winds encounter a mountain range, precipitation will occur frequently. One example of a mountainous area receiving frequent rain is Mt. Waialeale on Kauai, Hawaii. It is a sharp peak directly in the path of steady trade winds which blow from the northeast most of the time. On the upwind (northeast) side of Waialeale, the air rises and condenses, resulting in almost constant clouds—nearly every day experiences rain. Waialeale is among the wettest places on Earth: over a 10-year period, annual rainfall averages more than 1,143 centimeters (450 inches). This is more than 8 times greater than rainfall experienced in many parts of the midwestern United States. In contrast, on the downwind (southwest) side of Mt. Waialeale, the air descends, warms, and dries, in an area known as a "rain shadow." The result is a semiarid area with less than 51 centimeters (20 inches) of rain a year. This tremendous difference in precipitation—from 1,143 to 51 centimeters annually—occurs in a span of only 32 kilometers (20 miles). The formation of clouds and precipitation is a function of latitude, topography, and the presence of warm or cold oceans or large lakes, among other factors. 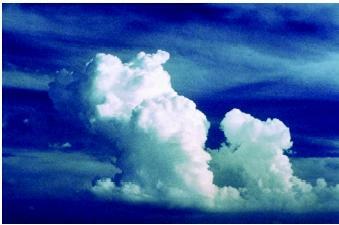 This cumulus cloud is building into a cumulonimbus, which can bring heavy thunderstorms and even tornadoes. and descending zones described above. Mountains can bring precipitation to normally dry areas, and downwind slopes of mountains can be dry, even in normally wet areas like the tropics. According to the water cycle concept, water originates in the ocean, evaporates, rises into the air, condenses, falls as precipitation, and returns to the ocean. * This concept is generally true. However, the temperature of the water exerts a strong influence on how well the cycle operates. The warmer the surface of the ocean (or a large lake), the faster it evaporates, all other things being equal. Warm ocean waters evaporate tremendous amounts of water into the atmosphere, causing the dew point to be very high. (Dew point represents the actual amount of water vapor in the air.) Near warm waterbodies, the air usually has enough moisture to produce abundant precipitation—all it takes is for the air to rise, either by heating, or by encountering a mountain or other elevated terrain. On the other hand, cold ocean currents are relatively passive when it comes to evaporating water, so the dew points in such areas are lower (and the precipitation potential is lower) than near warm water. As an example, consider two U.S. cities, both on the ocean at about the same latitude. Santa Monica, California, on the cool Pacific, is in the "wet winter, dry summer" zone between 30° and 50° North latitude, and receives only 36 centimeters (14 inches) of precipitation per year due to relatively low evaporation from the Pacific. Charleston, South Carolina, on the other hand, is on the very warm Atlantic. So much moisture is available to Charleston that it receives more rain in 2 months (July and August) than Santa Monica does all year, even though Charleston should also be a "wet winter, dry summer" location. For the year, nearly 127 centimeters (50 inches) are recorded in Charleston. Moreover, the high dew points yield very high humidity at Charleston and other eastern U.S. cities, making them more uncomfortable during summer. Meanwhile, in the "low dew point" city of Santa Monica, the residents are cooled by ocean breezes and enjoy steady sunshine during the typically very dry summers. SEE ALSO Climate and the Ocean ; Climate Moderator, Water as a ; Hydrologic Cycle ; Precipitation and Clouds, Formation of ; Weather and the Ocean . Rodgers, Alan, and Angella Streluk. Precipitation. Chicago, IL: Heinemann Library, 2003. Precipitation Trends in the 20th Century. Goddard Institute for Space Studies. <http://www.giss.nasa.gov/research/intro/delgenio_02/> . Cloud seeding is one form of humaninduced weather modification, which also includes hail suppression and fog dispersal. All of these are attempts to change weather conditions at certain locales. The purpose of cloud seeding is mostly to augment precipitation (rain or snow) from storms. Activities involve the release into storm clouds of tiny condensation nuclei, which are dust or chemical particles that allow condensation to occur more quickly. If properly administered, cloud seeding can increase precipitation by about 10 percent. * See "Climate and the Ocean" for illustrations of circulation zones and climate zones. * See "Climate Moderator, Water as a" for a diagram of orographic lifting.